The AEC road train was built by Hardy Motors a subsidiary of AEC (the Associated Equipment Company) for the British Overseas Mechanical Transport Directing Committee for heavy transport in remote regions of the British Empire [Mad88]. The road train consisted of an eight wheel drive tractor and two eight wheeled trailers. The first and last axles on the tractor steered in opposite directions giving good manoevrability. (This system is still used on the Esarco 8x8 for example.) The trailers were self tracking in that the front and rear bogies turned in opposite directions. By these means, wheels on all twelve axles would follow each other in the same set of wheel tracks. This improved the road train's offroad ability, also "enabling a right angle turn to be made through a ten foot gate" [Smi73]. The AEC tractor unit had only the most basic bodywork, this being quite sensible for warm climates given its low top-speed (20-30mph). 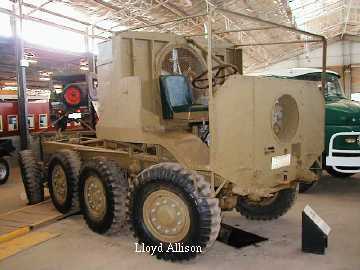 The large radiator cooling the engine was mounted behind the "cab" and provided with a large pusher fan. A smaller fan drew air through the engine bay. The brakes were unusual in acting on the rear trailer most strongly and so on down to the tractor. Three AEC road trains were built, one going to Africa and one to Russia. The third road train was brought to Australia in April 1934. Up to two more locally built trailers were used with it. Local tests were carried out under the supervision of Captain E. M. Dollery (later Brigadier) then in charge of motor transport for the Australian army [Smi73]. In April the road train set off from Adelaide via Oodnadatta to Alice Springs, arriving on 19 May, the trip of 1,100 miles taking over three weeks! It carried all of the fuel and water for the trip and the main difficulties encountered were soft sand, sandhills, mud near salt pans, and the many creek-bed crossings. One drawback was the road train's wide track, larger than that of other vehicles, which meant that it could not take full advantage of existing wheel ruts. Otherwise, the unit performed well during tests, without any mechanical problems. It was used for transport throughout the Northern Territory over the next ten years, covering over 800,000 miles. Liz Martin. Australia's Road Transport Heritage.